Thank you to Crown Publishing for reaching out to us to read The Moon Sisters by Therese Walsh. 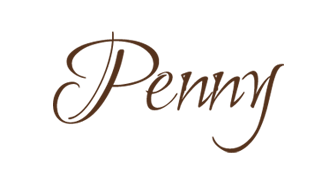 One of the first things we are guilty of doing is looking up what the book being pitched is about, (usually on Goodreads) and seeing what others have to say about it. 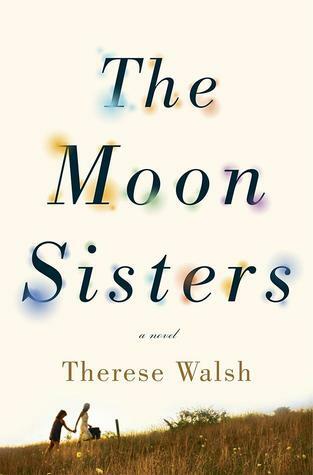 When I did this for The Moon Sisters, I saw that Therese Walsh’s debut novel was The Last Will of Moira Leahy. Hey! I read that book! I enjoyed it and the one thing I wrote about it was the compelling way Walsh wrote of the (strange, yet very interesting) bond between the twin sisters. Therefore, my acceptance to read The Moon Sisters was immediate after this discovery. I was immediately captivated by the tale of these two sisters within the very first pages in this story as well! Olivia and Jazz may be sisters, but could not be more different from each other. We find that Olivia is very much like her mother, a dreamer, while Jazz is the ever practical, no-nonsense type. They do not often get along, yet their bond to each other is very strong. Ms. Welsh has a wonderful gift of creating compelling and wholly believable characters. 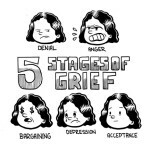 The Moon Sisters is broken down into alternating chapters between Olivia and Jazz but also sectioned into the five stages of grief. This novel has many layers, and gives the reader much to sit back and dwell upon while embarking on the journey that Olivia and Jazz undertake thanks to Olivia’s impulsive actions. Their journey is partly to overcome their grief following their mother’s death, to discover what their individual relationship to their mother was and to realize and find what their relationship means to each other is as well. The first section of the novel opens with the first stage, “Denial”, and is where Olivia comes home to find her mother dead at the kitchen table. She has left a note, explaining her reasons, but Olivia hides it so that she does not have to accept the truth. With or without this letter, her family knows, their mother has never been a woman filled with happiness, often lost to them in her dream world. She has spent years attempting to finish writing her fairy tale and publish it, but has had too many blocks to complete the ending to her satisfaction. Olivia does not want to push her mother into the past so soon and runs off in search of this bog and the ghost lights her mother so often dreamed about and mentioned to Olivia. She thinks by finding the ghost lights, she can be the one to finish her mother’s fairy tale. Before she comes up with the idea to travel to the find the ghost lights, she blinds herself by staring at the sun. Olivia has associated her mother with the sun and spent much of her time grieving by staring at the sun. Jazz has always been the one that has been given the task of looking after Olivia, making sure she doesn’t wander off, reigning her back in when she’s just as lost as her mother was in a dream-like world. So when Olivia takes off suddenly to find this bog and the Will-o-the-Wisps, Jazz is forced to go along and ensure she safely makes the trip. Jazz, as you can probably guess, is the complete opposite of her dreamer sister Olivia and her distinct personality comes through and off the pages immediately. Her head is never in the clouds, or ever on about finding ghost lights and fairies in a bog – ever. This was the dream their mother often spoke of – if she was only able to see the Will-o-the-Wisps, then her fairy tale story she’s been writing forever will find its ending. Olivia’s carefree and impetuous actions finds them lost on a crazy journey and at the start, Olivia meets a train hopper named Hobbs. Hobbs promises to take Olivia to the bog she is searching for. He is a homeless kid running from an abusive home and has permanently tattooed his face. Although Olivia knows he has a tattooed face, which she cannot really see, finds him beautiful nonetheless and falls in love with him. Jazz, of course, is very wary and feels he’s untrustworthy. Hobbs himself states that he is not a person to be overly trusted but together they continue on this journey to find the Will-o-the-Wisps. Along with the five stages of grief and the alternating perspectives of Olivia and Jazz, there are letters that their mother has written to her father, the girls’ grandfather, featured throughout the story. He has disowned their mother, cast her out as soon as he knew she was pregnant (with Jazz). These letters have never been mailed and in them pour out all the hurt their mother has endured over the years. She also shares her thoughts and musings about her daughters. These thoughts are taken to heart far more for Jazz as she reads more than anything what sounds like regret or sorrow for a life she feels she destroyed for her mother. 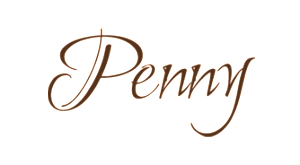 It is in these letters where you read about Beth’s wish for this fairy tale, but it is also one where you truly see how lost their mother was. She is overcome with grief about losing the relationship with her father. Truly, this was a woman that was not a strong as a mother the girls needed. Jazz is the one deeply affected by these letters and reads them the way that a daughter feeling on the outside of this family unit could only feel – that she is not the favourite, she is the troublesome one, beginning with her very being. Olivia is the light and shine of her mother’s life – or so it seems the way she writes about her, about her devotion to her. Jazz harbours these words from her mother’s hidden letters very deeply. She truly feels that she was a mistake that ruined her mother’s life. So, this journey is not only about finding these ghost lights, but a journey for each to learn about themselves, and also discovering what they meant separately and together to their mother. 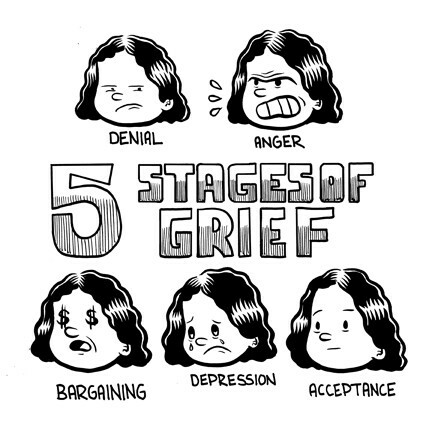 It is also a journey where they work through those stages of grief and come to terms with their mother’s death. In addition to these many layers in this story, I noted the different titles given to each of the girl’s chapters. Olivia’s chapters had titles like “On Fate. Or Luck”, “Cranberry Glades” and ” A Fortunate Thing” and “Another Way to Look at Things”. Whereas Jazz has titles like “Scars”, “Outlanders” and “A Fascination with Death”. So, you can see that care was even taken in the titles of the chapters, to show the dreamer personality of Olivia and the harder, coarse personality of Jazz. There is a lot being offered here in The Moon Sisters and overall, this multi-layered tale was a very good one. The ending is a solid one that brings the girls’ journey to a close and perfectly demonstrates the fifth and final stage of “Acceptance”. I once again enjoyed one of Ms. Walsh’s stories and look forward to reading more. Thank you again to Crown Publishing for sending this book to us, it is much appreciated.